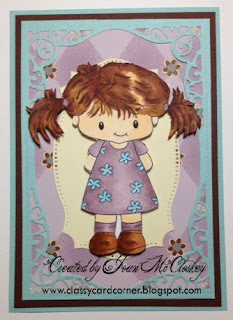 Hi my friends, glad you are here to visit and to check out my new cutie, Lily, over at the Brown Sugar "Color Combo Challenge". This is really a fun challenge!! So let's move on and let me tell you a little about my creation. The Aqua and Brown solid papers used are from Recollections. The die I used is from Spellbinders.....ummm, don't remember what the die name is. This is do to old age setting in.... LOL No memory!! But my friends say it gets better with age. LOL Okay, back to my card. What card?? 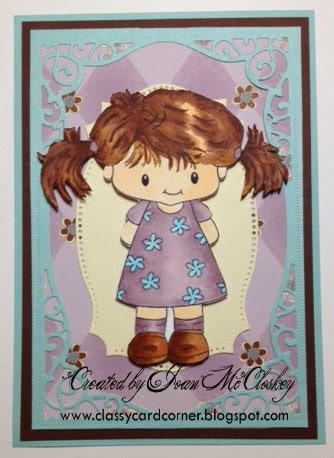 The adorable "Lily" image is from Crafty Sentiments Designs and they have some really cute digis, plus personalized mugs, totes, etc. Check out their store!!! It's awesome!! I colored the image with my Copic Markers. Well, that finishes us up with my Lily Creation. Now it's your turn to get your creation posted as you could be the next winner!!! Okay, I had to look this info up on my die or I would have been awake half the night trying to remember the name, so it is Nestabilities Majestic Labels Twenty-Five Die Templates.